This set of three hand tools has been specifically designed for children aged 1 and up, making them the safest and most functional gardening tools available for kids. These durable, one-piece ABS plastic tools are made to function ergonomically for children. 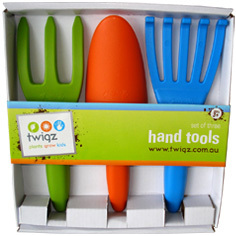 The set contains a hand fork, trowel and a hand rake that is presented in a box set. These tools will get every child potting up plants and growing fruit and flowers before you know it!